Figure 6-19. 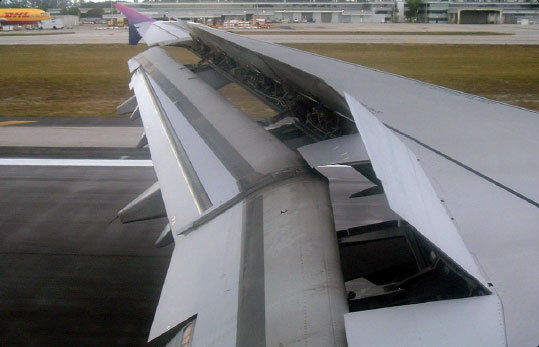 Spoilers reduce lift and increase drag during descent and landing. Figure 6-20. The movement of the elevator is opposite to the direction of movement of the elevator trim tab. If the trim tab is set to the full nose-up position, the tab moves to its full down position. In this case, the air flowing under the horizontal tail surface hits the tab and forces the trailing edge of the elevator up, reducing the elevator’s AOA. This causes the tail of the aircraft to move down and the nose to move up. In spite of the opposing directional movement of the trim tab and the elevator, control of trim is natural to a pilot. If the pilot needs to exert constant back pressure on a control column, the need for nose-up trim is indicated. 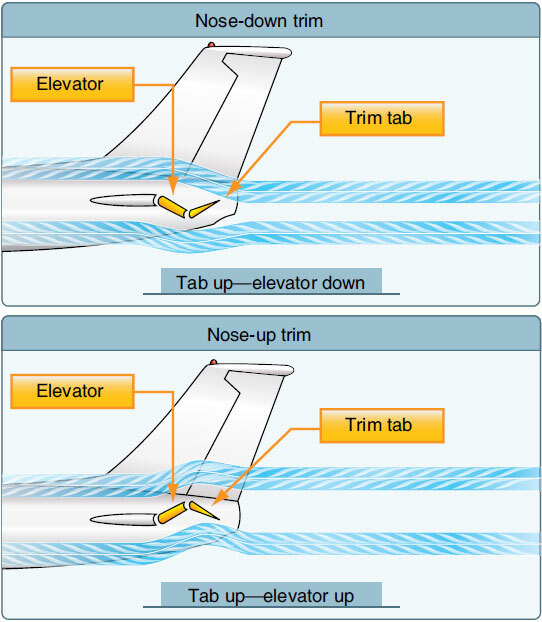 The normal trim procedure is to continue trimming until the aircraft is balanced and the nose-heavy condition is no longer apparent. Pilots normally establish the desired power, pitch attitude, and configuration first, and then trim the aircraft to relieve control pressures that may exist for that flight condition. As power, pitch attitude, or configuration changes, retrimming is necessary to relieve the control pressures for the new flight condition. The control forces may be excessively high in some aircraft, and, in order to decrease them, the manufacturer may use balance tabs. They look like trim tabs and are hinged in approximately the same places as trim tabs. The essential difference between the two is that the balancing tab is coupled to the control surface rod so that when the primary control surface is moved in any direction, the tab automatically moves in the opposite direction. The airflow striking the tab counterbalances some of the air pressure against the primary control surface and enables the pilot to move the control more easily and hold the control surface in position. If the linkage between the balance tab and the fixed surface is adjustable from the flight deck, the tab acts as a combination trim and balance tab that can be adjusted to a desired deflection. Servo tabs are very similar in operation and appearance to the trim tabs previously discussed. A servo tab is a small portion of a flight control surface that deploys in such a way that it helps to move the entire flight control surface in the direction that the pilot wishes it to go. A servo tab is a dynamic device that deploys to decrease the pilots work load and de-stabilize the aircraft. Servo tabs are sometimes referred to as flight tabs and are used primarily on large aircraft. They aid the pilot in moving the control surface and in holding it in the desired position. Only the servo tab moves in response to movement of the pilot’s flight control, and the force of the airflow on the servo tab then moves the primary control surface. Figure 6-21. An antiservo tab attempts to streamline the control surface and is used to make the stabilator less sensitive by opposing the force exerted by the pilot. Figure 6-22. 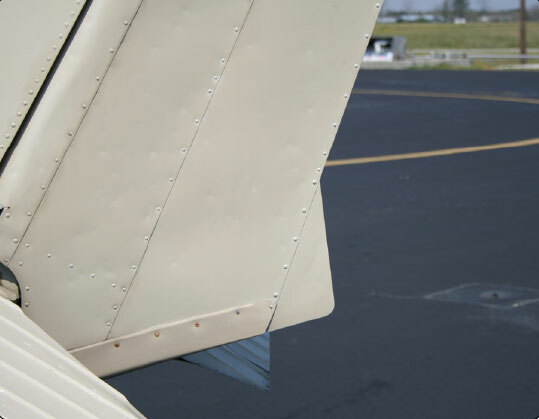 A ground adjustable tab is used on the rudder of many small airplanes to correct for a tendency to fly with the fuselage slightly misaligned with the relative wind. 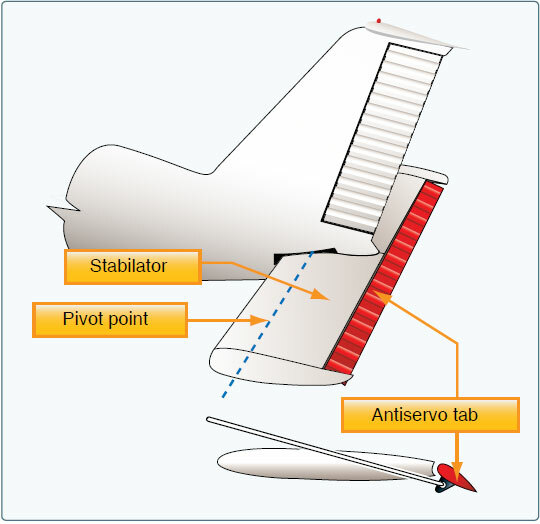 Rather than using a movable tab on the trailing edge of the elevator, some aircraft have an adjustable stabilizer. With this arrangement, linkages pivot the horizontal stabilizer about its rear spar. This is accomplished by the use of a jackscrew mounted on the leading edge of the stabilator. [Figure 6-23] On small aircraft, the jackscrew is cable operated with a trim wheel or crank. On larger aircraft, it is motor driven. The trimming effect and flight deck indications for an adjustable stabilizer are similar to those of a trim tab. Figure 6-23. 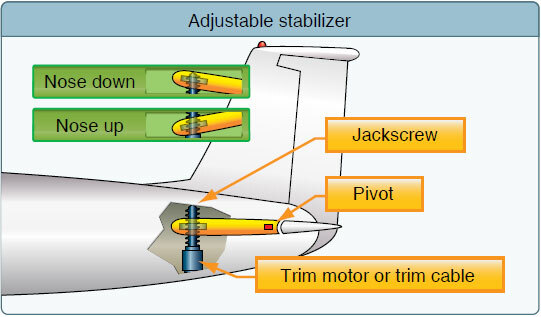 Some aircraft, including most jet transports, use an adjustable stabilizer to provide the required pitch trim forces.